(EGO-realISM) through its extension of lines of force. and the outer arena, the material environment. the pre-personal spirit life blueprint fragment causal presence. Holy Spirit of the Creative Daughter of the local universe of Nebadon. Thought Adjuster pre-personal life blueprint carrier spirit fragment. The LOWER FIGURE presents the evolving solar human PUMA ego-self. association with the Thought Adjuster, which is the Father’s gift to man. the Creative (Daughter) Spirit’s gift to man. constitute man(in-festation) of a spirit personality in potential destiny. certified by the (Chief) Personalized Adjuster of Urantia (earth, Gaia). always subservient to your will. 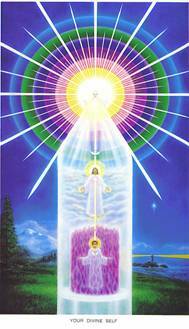 attainment of every step of the tremendous transformation of your ascension career.